Admiral Sir Robert Lambert, commander of the Cape Town Naval Station in the early 1820’s, ventured up to the Cape West Coast in 1926 to map out the furthest reaches of this rugged coastline. The town of Lambert’s Bay was later named to honour this adventurous spirit. Set three kilometres from the sea at Lambert's Bay, the 10-hectare Sir Lambert vineyard produces excellent Sauvignon Blanc and Shiraz grapes. The character of the wine is crafted by the unique location of the vineyards, right at the spot where the sea breeze blowing in from the icy-cold Atlantic Ocean meets the dry heat of the land. 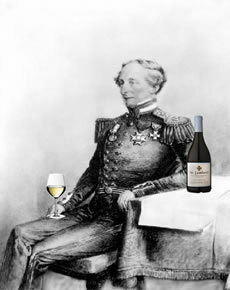 The Sir Lambert Sauvignon Blanc - the first to be certified as being made from grapes of this ward - has achieved critical acclaim, including a Gold Medal at its debut at the Michelangelo International Wine Awards. The wine is a true product of Lambert's Bay. Local people pick the grapes by hand early morning to ensure that the unique cool-climate characteristics are captured and retained. Climate: Moderate with cooling sea breezes from the Atlantic Ocean. The grapes are harvested early morning. Harvesting is done by hand. Minimal intervention in the natural process of vinification, allowing the cultivar to express its individual characteristics and the terroir of its origin. After fermentation the lees were stirred up once a week for concentration and mouth feel. A great aperitif. Ideally suited to sushi, shellfish and summer salads. Minimal intervention in the natural process of vinification, allowing the cultivar to express its individual characteristics and the terroir of its origin. Traditional punch-downs every 4 hours during fermentation, 16 months 75% new French oak maturation. This cool climate Shiraz presents an intense nose of ripe plums, pomegranate and fynbos. These flavours with well integrated French Oak follow through on the palate, producing a wine with supple tannins and a velvety finish. Enjoy with spicy red meat dishes including venison.